Thanks to you and the interest in this very worthy cause, our group is at 60 + Quilters! 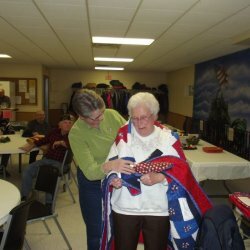 What better way to honor our Veterans than with the start of our own "Woodside Quilting - Quilts of Valor Group". We are proud to be the first Certified QOV Quilt shop group in the nation! Interested in Joining a QOV Group? If you are in the Des Moines and surrounding areas and are interested in joining a QOV Group, our QOV Group at Woodside Quilting in Des Moines Iowa welcomes you. We have programs like Monthly Sew In’s, Guest Speakers, Trunk Shows, QOV Retreats, a QOV quilt block program, National teachers and other opportunities in the shop with lots of fun creating Quilts of Valor for many deserving individuals. You don't need to be a quilter to join our QOV group. There is always a need for people at our Sew days to help iron, bind, help with presentations, fundraising and we also need people to help with quilting the QOV finished tops. If you are interested in the QOV group, stop in, email or call the store to register your name and get on our email list. We will have lots of exciting fun ahead of us! Our Group meets the 3rd Thursday and 3rd Saturday of the month (full weeks). Please see our calendar of events for the dates. We work on our own QOV quilts and we plan group QOV quilts and other events for those days. These special fun group projects are announced in our Member Group QOV emails. We also have a QOV quilt block program. These block kits come with a free pattern and are $3.00 per kit. You don't have to be a QOV group member to purchase and make a block. They are for anyone who wants to contribute to this worthy cause. You may return the finished block to the store to use for one of our "Sew Days" and contribute to a QOV quilt. We change the design and fabrics of the Quilt blocks every so often so stay tuned for new ones to come. 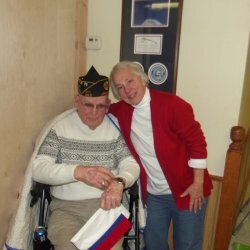 A little bit about Quilts of Valor for those of you that are new to the foundation. 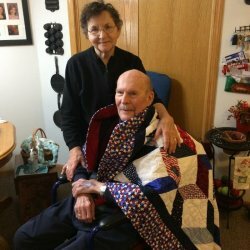 The mission of the Quilts of Valor Foundation is "To cover service members and veterans touched by war with comforting and healing Quilts of Valor." If you were not able to attend the kick off you can still join us. Throughout the year we will have lots of events making QOV quilts for many deserving individuals. Stop in the shop to sign up. There is a nominal individual $5 member fee collected annually by us on behalf of the QOVF. A membership card for each member. A commemorative lapel pin for each member (new design annually). Authorization to raise money, accept donations, and accept non-monetary gifts to meet local needs using the QOVF name. Use of 100% of funds raised through an expense reimbursement process. Advance notice of upcoming QOVF special events, monthly specials from QOVF supporting companies, and discounted opportunities to participate in other quilt related events. Here are QOV Quilt Awards our group have done. This is a very rewarding experience! Dave Grant was born in Des Moines and is a graduate of East High school. Dave is a combat disabled Vietnam Veteran where he served in the US Army completing basic training at Fort Bliss Texas and Armor School at Fort Knox Kentucky. Dave served in Vietnam from October 1968 in the 9th Infantry Division and 3/5 Cavalry returning home in October 1969. Upon returning home Dave served at Fort Hood Texas in the 2nd Armor Dave is very active in community outreach activities with the Des Moines, Iowa DAV Chapter 20. We were very excited to honor many Veterans at the Quilts Of Valor Expo. in downtown Des Moines at Hyvee Hall last week. Here are 10 of them that were WWII or Korean Veterans we honored from the IllaHee Hills Retirement Center in Urbandale. They are an absolute fun group and we were very humbled to honor them for their service to our country with a QOV. Here are just some of the pictures. We will be doing more awards for them at their retirement center on Saturday June 11th. 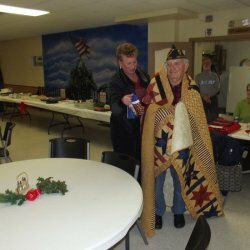 In December some of the members of our QOV group had the honor of attending the Urbandale American Legion Post to recognize and award Quilts of Valor to many of it's members. 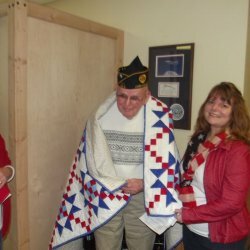 It was an honor for us to award these quilts and they accepted their quilts with pride and thankfulness. 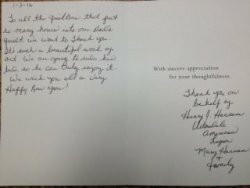 One member could not be there, so there was a special thank you note sent on his behalf below. These photos and note were moving to us all.